Washington County was ranked among the best in food security, but thousands are still starving. While food insecurity continues to be a massive problem across much of Oregon, closer to home, Washington County residents are some of the least likely to go hungry, according to a new report released last week by the Oregon Center for Public Policy. 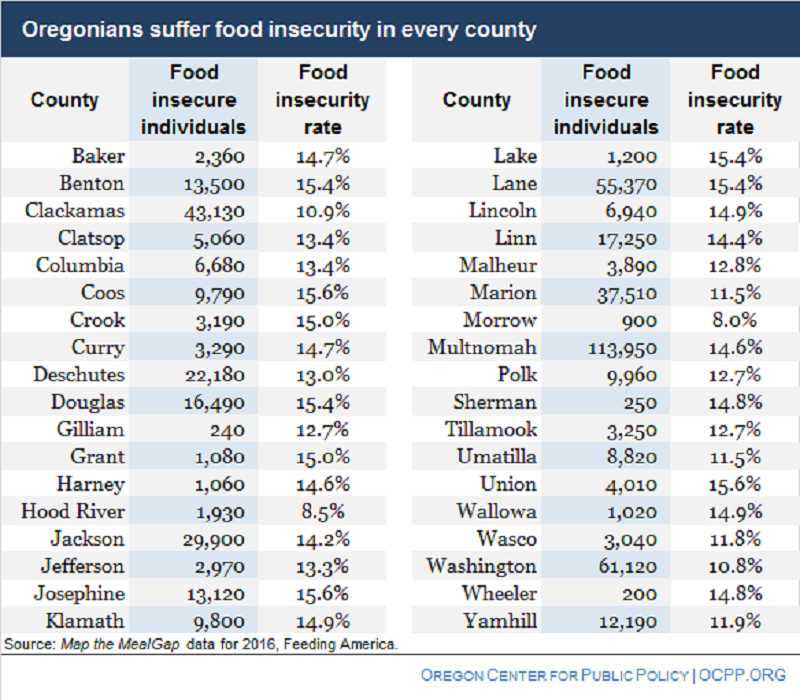 In a report released Wednesday, June 20, by the left-leaning Portland think tank, Washington County ranked third lowest in food insecurity in the state in 2016, the most recent records available. The findings were based on a study of food banks and pantries across the state. Despite the low score, still one in 10 people in Washington County — more than 61,000 residents — were food insecure that year, meaning they either went hungry or didn't know where their next meal was coming from during the year, according to the center. The numbers were worse for Washington County children, where more than 24,000 kids — nearly one in five across the county — didn't have reliable access to food. Washington County was behind Hood River County and tiny Morrow County in Eastern Oregon, which have food insecurity rates around 8 percent and much smaller populations overall. Multnomah County, Oregon's most populous, had nearly 15 percent of its population suffering from food insecurity, ranking it 20th among Oregon's 36 counties. Janet Bauer, a policy analyst with the center, said issues such as high housing costs and child care are adding pressure to families. "Food is one of the first things to be compromised when people are having a hard time," Bauer said. "I call it the 'canary in the coal mine' of economic security." According to the report, food insecurity can have damaging effects on health, contributing to a host of mental and physical health issues, including higher rates of asthma, cancer, heart and kidney disease, sleeping problems, depression and suicidal thoughts. "It is a wakeup call," Bauer said. "The economy and the jobs numbers are looking good. We have unemployment rates lowest we've seen in years. But what's going on is that people's earnings aren't keeping up with their expenses, simply put. We need to look at wage growth and family budget realities." Oregon once had one of the highest food insecurity levels in the nation a decade ago, improving that to about 14th in the country. The U.S. Department of Agriculture has said that Oregon improved slightly over the past few years, but Janet Bauer, a policy analyst with the center, said the state still had a long way to go to address the issue. "People who have a slightly higher income, above 180 percent of the federal poverty level, are still frequently having challenges making ends meet," Bauer said. Programs like Supplemental Nutrition Assistance Program, formerly known as Food Stamps, provide benefits to low-income households to help purchase food. Programs like these are the best weapon to combat food insecurity in Oregon, Bauer said, but a recently filed bill in Congress would have made many Oregonians who depend on SNAP ineligible for the program. "Among households with children that sign up for the program, SNAP reduces food insecurity by as much as 31 percent," the report said.